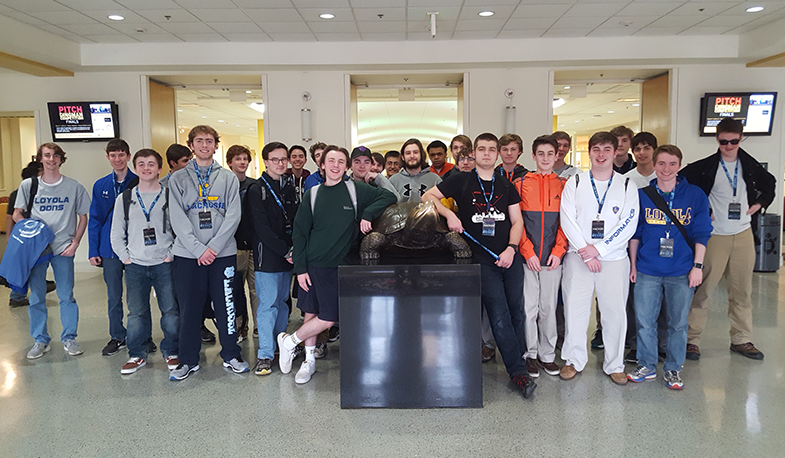 Twenty-five of our cyber science students traveled to the University of Maryland College Park this past weekend to take part in the Metropolis Cyber Skyline Competition. The event was at full capacity with 288 competitors ranging from high school students to seniors in college. There were all types of challenges and problems to solve from every facet of cybersecurity. The event consisted of two rounds of competition and a corporate-sponsored challenge. The first round was won by a team from the ACES (Advanced Cybersecurity Experience for Students) program at College Park, in which Loyola Blakefield alumni Jeremy Krach ‘13 and Chris Rodriguez ’13 are enrolled. A team of four current Loyola students won The MITRE Corporation sponsored challenge. "It was a fun day to hang out at College Park and hold our own against college computer science students," said Steve Morrill, Director of Loyola Blakefield's Cyber Science Initiative. Sharon Akers, Vice President of Corporate Relations of St. John Properties and Executive Director of the Edward St. John Foundation, stated, "The Edward St John Foundation & St. John Properties is proud to be a cornerstone partner of the CSI initiative at Loyola Blakefield. The students’ continued joy for learning, commitment to the sciences, and drive and determination has allowed them to compete with other elite computer science students at the collegiate level. We are excited to see the positive impact these students will continue to have on the digital world, both now and in the future. We are truly honored to have our name associated with this tremendous program."